An Interview with Grapo owner and managing director, Radim Kralik about TECHNOLOGY IN REALITY - Effetec s.r.o. Grapo Olomouc belongs to the most famous advertising producers and providers of comprehensive advertising services. 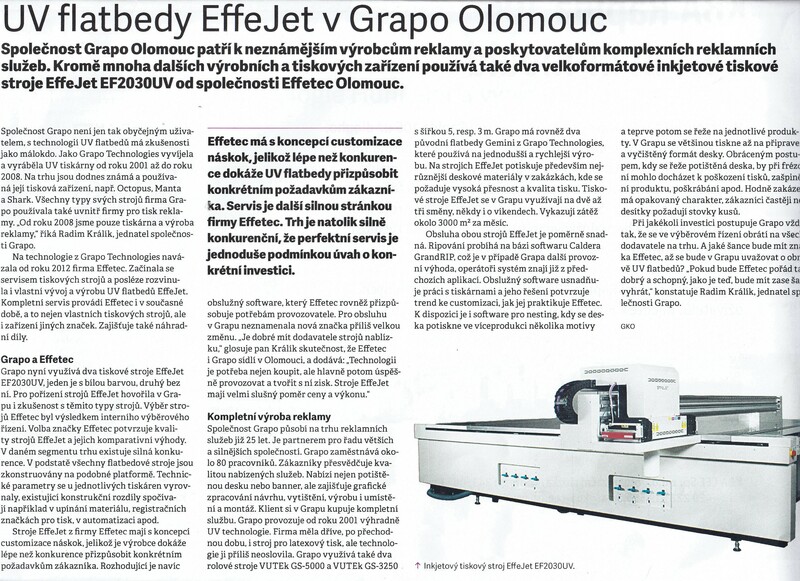 In addition to many other manufacturing and printing facilities, Effetec EF2030UV is also used by Effetec Olomouc’s large-format inkjet printing press. Grapo is not just an ordinary user, with UV flatbed technology, it’s full of people with experience. As Grapo Technologies, UV printers had been developing and manufacturing from 2001 until 2008. The printing press, such as Octopus, Manta and Shark, is still known and used today. All types of its machines have been used by Grapo inside the print advertising business. “Since 2008, we have only been printing and advertising,” says Radim Králík, managing director of Grapo. Grapo Technologies has been running Effetec since 2012. It began with the printer service and later developed its own development and production of EffeJet UV flatbeds. Complete service is also being carried out by Effetec at the present time, not only for their own printing machines but also by other brands. It also provides spare parts. Grapo has been operating in the advertising market for 25 years. It is a partner for a number of larger and stronger companies. Grapo employs about 80 people. Customers are convinced by the quality of the services they offer. Offering not only a printed board or banner, it also provides graphic design, print, production, and location and assembly. The client purchases a complete service at Grapo. Grapo has been operating exclusively UV technology since 2001. The company had a latex printing machine before, but the technology had not touched it too much. 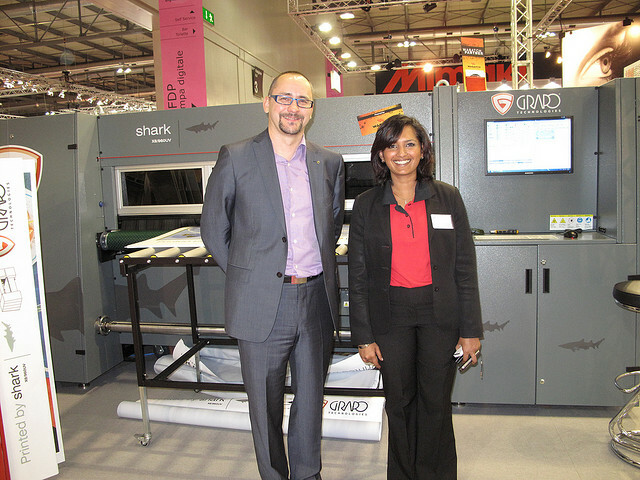 Grapo also uses two VUTEk GS-5000 and VUTEk GS-3250 roller machines with a width of 5, respectively. 3 m. Grapo also has two original Gemini flatbeds from Grapo Technologies, which it uses for simpler and faster production. On EffeJet machines, it mainly prints a variety of sheet materials in orders where high accuracy and print quality are required. EffeJet printing machines are used in Grapo for two to three shifts, sometimes on weekends. They show a load of about 3000 m² per month. Operation of both EffeJet machines is relatively easy. Ripping takes place on the basis of Caldera software, which in Grapa’s case is another operational advantage that operators already know the system from previous applications. Utility software makes it easy to work with printers, and its solution confirms the trend to customize it as Effetec is doing. There is also a software for nesting when the board prints in multiple production of several motifs and then cuts on individual products. In Grapo, it usually prints up to a ready and clean sheet format. By reversing the process the printed board or print jobs can get the printed product dirty, scratches, etc. could be damaged during milling. Many jobs are repeated, customers demand more than a dozen hundreds. In any investment, Grapo always goes through the selection process to all suppliers in the market. And what’s the chance the Effetec brand will have to think of in the Grapo’s renewal of UV flatbeds? 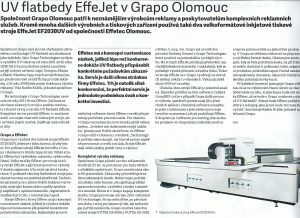 “If Effetec is still as good and capable as he is now, he will have a chance to win,” says Radim Kralik, managing director of Grapo. Effetec has a head start with the concept of customization, as it can more than compete with UV flatbeds to suit specific customer requirements. The service is another powerful aspect of Effetec. The market is so strong that the perfect service is simply a condition for consideration of a particular investment.